Stolen from their wartime hiding place in Berlin Zoo by Soviet soldiers in 1945, the famed gold treasures of the lost city of Troy, have not been seen since. As the world awaits the treasure's first public display by the Russians for almost sixty years, Caroline Moorehead tells the continuing story of loss and rediscovery suffered by King Priam's riches since Heinrich Schliemann, an archaeologist who had made his fortune in the Californian gold rush, first excavated the lost city of Troy on the shores of Asia Minor in the 1870s. In spring 1945, the Red Army entered Berlin. Not far from the Reichs Chancellery was the Berlin Zoo with an anti-aircraft tower. Inside were crates containing Heinrich Schliemann's famed collection of gold from the lost city of Troy, King Priam's riches — gold diadems with leaf and flower pendants, gold bottles, gold earrings and 9,000 gold rings and buttons — one of the most complete and valuable finds ever made by an archaeologist. On June 3 the crates were dispatched to Moscow by military aircraft. And there they and their contents vanished. Caroline Moorehead's story actually begins in the 1870s. Heinrich Schliemann, a merchant who had made his fortune in the Californian gold rush, set out to discover the missing city of Troy, and to prove that the Trojan wars described by Homer in the Iliad and the Odyssey were literal history and not poetic tales. With his seventeen-year-old Greek wife Sophia, he started excavating in Greece and on the shores of Asia Minor. In the teeth of bitter archaeological controversy he unearthed jewellery, pots, weapons enough to provide strong evidence for the Trojan wars. By the time he died in 1890 he was universally recognised as the 'father of pre-history'. What helps make the story of the missing gold so extraordinary is the character of Schliemann himself: boastful, vainglorious, extremely sensitive to criticism, pugnacious — a man so desperate to prove his point that he was prepared to lie and cheat. The treasures from Troy, offered to the most prestigious museums of the world and turned down by all of them, were eventually given to Germany — the country where he was born. 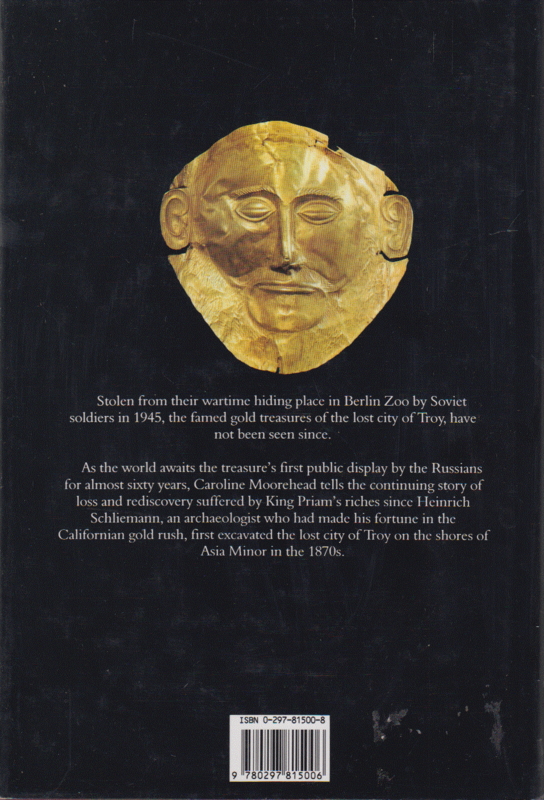 The story of the gold is one of repeated loss and rediscovery: as the world awaits its first public display by the Russians for almost sixty years — the Turks, the Germans and the Russians themselves are preparing to fight over the treasures' eventual destination. 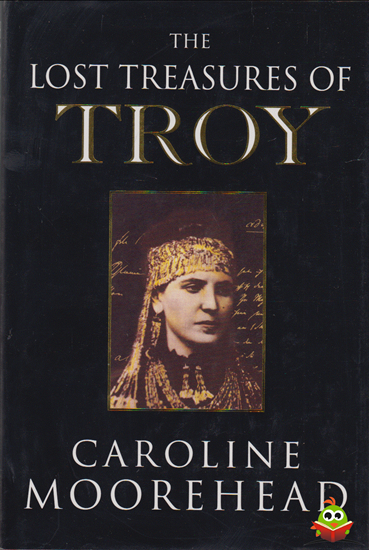 Caroline Moorehead has spent two years on the trail of the lost treasures of Troy, and the strange and elusive Heinrich Schliemann and his young bride Sophia Schlicmann. Here she tells of the remarkable steps that lead him to Troy and the journey across Europe taken by the gold ever since. Hardcover. Hele lichte leessporen, niet in geschreven of gevouwen. Bovenzijde boekblok hele lichte gele stipjes. Stofomslag heeft wat doffe plekken / krasjes.